This plugin mod is "Retired" as of EQ2Map 1.1.1+. It will no longer be updated or corrected to work with the latest versions of EQ2Map. 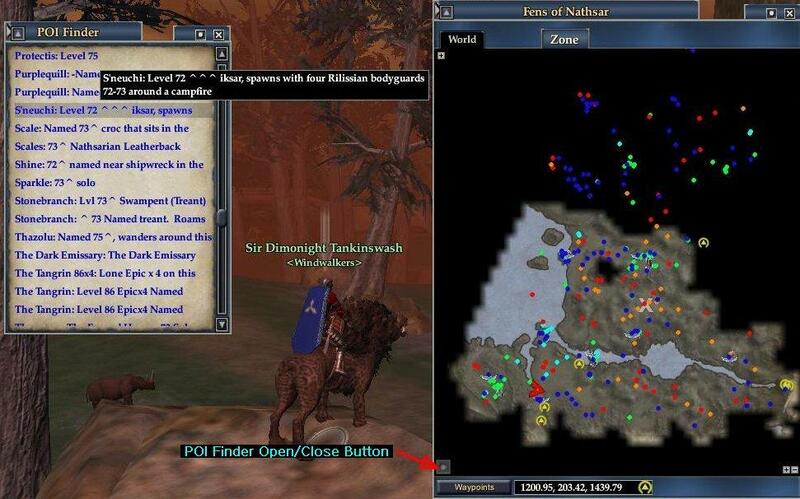 This is because all POI Finder functionality is now built-in to the EQ2Map via it's All Button list. But if for some reason you are still using the older style EQ2Map, then the POI Finder may still be useful. See below for details on how to use it. This mod is basically a newer version of mother9987's terrific EQ2Map Map Spoiler Project mod. I was prompted to make this version because the spoiler links were never updated often enough to be more then a small subset of those available as EQ2Map POIs (Points of Interest). And the links that did exist often weren't descriptive enough. I also updated the mod name to be "POI Finder" because its not really a spoiler tool (in my eyes at least). All the info it provides is already part of the basic EQ2Map mod - but that info was very difficult and annoying to find especially on the large and heavily POI'd outdoor maps. Using this mod, finding the POI you need for a quest should be considerably easier. Basic features are identical to mother9987's version. Clicking on a link will create an X on the EQ2Map at the POI it refers to and activate the tracking path visual if you are close enough to it. Like before the POIs are split into 6 categories (Locations, Monsters, Named Monsters, NPCs, Quests, and Zone Lines) and alphabetized. And unlike before, all POI links now have tooltips that match (minus the UID info) the tooltip you see by holding your mouse pointer over the actual EQ2Map POI icon. This mod is an add-on for the ever-popular EQ2Map Mod. So make sure that is installed first. It should work fine with both the Manual and Auto Updating versions. Inside of your EQ2 installation directory there will be a folder called UI. Two subdirectories deep inside of that will be a folder named eq2map that contains several icon_something.xml files and a bunch of plugin_#.xml files. The tricky part is that the directory that sits 1 deep inside the UI folder and that holds the eq2map folder could be named many different things. And is sometimes also called eq2map. This middle directory inside of the UI directory is where you need to extract the downloaded zip file for this mod. I will refer to it from here on as the POIFinder Install Directory. So if your directory path looks something like Everquest2\UI\customDir\eq2map, then your POIFinder Install Directory is customDir (doesn't have to be called customDir - could be named anything). 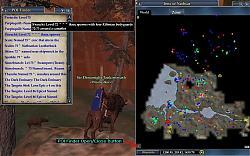 Or if it looks like Everquest2\UI\eq2map\eq2map then it is the FIRST (left) eq2map folder. Use a program like Winzip or UltimateZip to unzip the downloaded file. When it asks you about a destination for the extracted files, point it at the POIFinder Install Directory identified in Step 2. If the unzip utility asks if you want to overwrite a pre-existing file make sure you say yes for all. At the very least it should ask about overwriting plugin_7.xml. If it does not, you may want to re-read Step 2 again. eq2ui_custom.xml: Look in the POIFinder Install Directory for a file called eq2ui_custom.xml. If not there, rename the eq2ui_custom_example.xml file that should also be in the POIFinder Install Directory just by removing the _example part so it becomes eq2ui_custom.xml. In all other cases where you already have the eq2ui_custom.xml file in the POIFinder Install Directory, don't delete it or rename the example version. While some mods like the Profit Reborn UI mod that also use eq2ui_custom.xml may have already included the necessary line to enable POI Finder, you should check by searching the file with a text editor program for the line <include>eq2ui_custom_poifinder.xml</include>. If you don't see it but do see other <include>somefile.xml</include> lines, add the line you were searching for below all the other includes. Basicly, it should look similar to the eq2ui_custom_example.xml file with the possible addition of extra <include> lines. eq2ui.xml check: Another potential installation problem can be averted by looking in the POIFinder Install Directory for the eq2ui.xml file. If it is NOT present you should actually be fine and don't have to do anything. But if it is there, it was added by some other UI mod and you need to make sure it already contains the line <include>eq2ui_custom.xml</include>. If not, edit the file and add it below all the other <include> lines. Don't forget to save any files you edited once you are done changing them. 1.60 (8/30/08) - POI Finder window can now be expanded horizontally. The length of the links hasn't been lengthened (I'm considering it for a future version) but this may help some people for whom the default text for some reason is extra large or who want to minimize the width. 1.55 (8/30/08) - More unnecessary XML removed for smaller download and to streamline the files. Selected list item will have a darker background and lighter text. 1.51 (12/2/07) - Open/Close button has been made slightly larger and moved further from edge to aid seeing and clicking. 1.50 (11/29) - The last "Issue" is now gone! The launch button will now both open AND close the POI Finder window. Also the button has been moved to the lower left corner (see new screen cap above) to keep it away from the POI Filter settings pulldown button. And as if that weren't enough new links wiill automatically load as soon as a new map area or zone is entered. No more mousing-over needed. Major props go to gm9 once again for providing me with the XML for these changes and fixes. 1.36 (11/27) - Functionally the same as 1.35, but I removed some un-needed extra XML from all the finder link files on a tip from Jnils. Download size is a few Kb smaller and mod may load a tad quicker. 1.35 (11/18) - Included eq2ui_custom_example.xml file with download in order to simplify the install process. More help from gm9 fixed the issue with multi-map zones. 1.30 (11/15) - Switched to use new custom.xml file that came with GU40. Much help was provided by gm9 of ProfitUI Reborn fame. 1.20 (5/16) - Added XML that will make Talyns' ShrinkMap Plugin work better by moving the POI Finder button to a less intrusive spot when map is shrunk. 1.15 (4/13) - Using ESC will now only close the POI Finder and not the EQ2 Map window as well. 0.90b (3/14/07) - Initial release. Great work here. Loved Mother's idea and you have just perfected it. Thank you so much for this. Always thought about manually doing it but you have gone one way better. This should become one of the necessary downloads for everyone. Thanks again! Wasn't sure if you wanted comments here or in another thread but I only found one in the EQ2MAP forum and not in the Beta forum. Therefore, I chose here just to be safe. Thank you very very much. I can only imagine how huge this updated version is going to be. Without the Spoiler Project I would have given up long ago. Not really, but you get the picture. This update looks really good and the addition of the tooltips is awesome. This might be a bit much and probably not even possible but it couldn't hurt to mention it. I'm using FetishClassic and the map that comes with that mod allows us to select any zone from a drop down menu. While the POIs will come up in the Finder and the tooltips work correctly the ability to select a link and have it mark the map with an X is not currently possible. Of course it works properly on the correct current zone but if I change the zone (such as if I select Zek from the drop down while in Qeynos Harbor) that particular function won't work. It didn't work with the Spoiler either so it doesn't have anything to do with the update but if it's something that could be added at some point that would be great. It probably can’t, as I would imagine that the X mark is tied into the Waypoint system, which probably only works for the zone that you are actually in at the time. Lastly, if you need someone to check out the other zones for POI links I could always do that for you or you could always try the Fetish map for yourself and see if that helps with testing. So far, all of the zones that I've checked with the Fetish map have shown the POI links in the Finder window but I've only checked a select few. At any rate, Thanks again and I'm highly looking forward to any further advancements that you might come up with for this project. Take care and best of luck mate. great job, thank you for all the hard work. 1 small point though, i think the example file needs updating, as some things have changed since this one was used. at least it didnt work for me =( as the browser entry is missing from the example.xml. I copied the default eq2ui_mainhud.xml to my custom ui folder and added the mapspoiler and all works well. Last edited by wolfling : 03-16-2007 at 02:10 PM. Loved the Map Spoiler Project. I've installed your version but it will not populate. The window comes up, completely, with all the graphics, but it doesn't matter how many times I open and close the map window, it will not populate. I'm using ProfitUI with some addon's I've put in, including the shrink map addon. Maindhud.xml comes with the spoiler xml already in it, and I've double checked for spelling, etc. Still no go. Not yet, but I've been suffering a similar problem when trying to make the final changes (autogen'd plugin_7 and scrollpage; renaming paths and files from spoiler to finder) in order to get this to version 1.0. I'll be investigating it some more today and if I can nail it down I'll let you know. Wolfling, thanks for that reminder about the example file. Plus I may go with a completely renamed mainhud file (eq2ui_mainhud_poifinder.xml instead of eq2ui_mainhud_mapspoiler.xml) and subdirectory for the "finder files". Either way I'll be adding much more detailed installation details to this page. Great work - ever consider releasing the exe to have folks run their own xml generation after they've run an eq2maps update? That'd save some time between updates on your end and when they're released with eq2maps. Would definitely save you (as an author) a great deal of time I'd think. Either way, this is tremendously appreciated. Any chance of having the window open / close with the map? How about close on ESC? Wizairde: I have entertained the "release the code" idea but it probably won't happen anytime soon. There are still a few features I'd like to add and I have the professional programmer's code possesiveness disease. Perl scripts aren't exe's - they're litterally code that is run through an interpreter. Plus I don't think missing out on a few week's worth of POI updates at a time would terribly inconvenience anyone's cheat... er I mean POI finding ability. With the possible exception of right after a new expansion comes out. And I'd make a point of puting up a timely update in that case. However if I ever quit EQ2 or just find myself growing weary of the constant update posting process, I'll definitely release it. FloridaFringe: The problem is I have little actual EQ2 UI moding exerience using the conventional tools. In this case I just took the XML from Mother's design and automated or tweaked the basic structure she already had. Adding the tooltips was basicly a guess on my part that happened to be simple and work well. Event handling and getting multiple windows to work together seems a bit more complex. But If you can point me to XML examples of such features in other mods I could try to figure it out and incorporate them. Excellent mod. I have been waiting for someone to do this. I am surprised that it has not been integrated into EQ2Maps already. Thanks for your work and sharing it with the rest of us. Last edited by Englan : 03-20-2007 at 11:41 AM. Altho I'm having a small problem, the poifinder window is all black, I get the poi info locations etc but no scrollbar, background or anything..
Edited the eq2ui_mainhud.xml like you described, unzipped to right dir etc. No idea whats wrong. Fixed it, apparently eq2 changes the eq2ui_mainhud.xml in default folder, so I copied it to my custum ui folder and edited it. Works great now, wonderful mod, many thanks! Last edited by Metha : 03-21-2007 at 06:42 PM. Great job TreeMos. This works nicely with ProfitUI II and the standard map mod. Last edited by Brorim : 03-30-2007 at 09:24 AM. is there anyway to this to work thorui? Last edited by xephonics : 03-30-2007 at 09:50 PM. I'm not sure, but assuming it uses EQ2Map there's probably a way. I'd do a file content search for the line wihich includes eq2ui_mainhud_map.xml like I describe in the installation instructions above. Once you find that just add the poifinder line below it like you would in the eq2ui_mainhud.xml file.